I've been on hiatus lately. It seems like time just sneaked up on me over the last couple of months and I never got around to adding anything to my blogs. I think I've also hit a writing snag that has contributed to the lack of posts. But, since it is the last day of 2007 I thought it only fitting to at least tell everyone about a few new links to visit in the coming year. Garden Outfitters has everything for your garden from arbors to furniture to sundials. This company is an offshoot of Outdoor Fence Company, in business since 1974. Looks like they are a one stop shop for all of your yard and garden needs. Perfection Landscaping provides a variety of professional landscaping services for residential properties including landscape lighting, irrigation systems, lawn sprinkler system, driveway installation, patio installation, & residential landscape design. Give them a call or visit them online for more information. Earthstone Studio offers high end natural stone fountains, statues and planters. Their products are beautiful and worth a look. Wind Chimes Pavillion carries what else? Wind chimes of course. They have a gorgeous variety worth taking a look at. There's nothing like the sound of chimes in the garden breezes. Last but not least, Urban Garden Wholesale is dedicated to providing gardeners, growers and plant enthusiasts with gardening supplies. They have lots of products and information for both indoor and outdoor gardens. Visit their website when you get a chance but be sure to put your feet up since you'll be there for awhile. Happy Gardening. 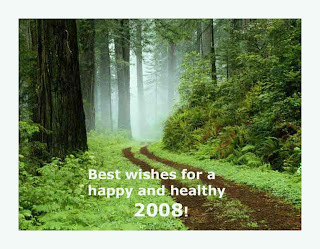 I wish everyone a very happy and healthy 2008.